A day prior to the uber exclusive Magnum Party 2015, I entered the Labels Store with my eye on the prize. I knew I had to hunt through racks of designer outfits to make a choice for the right dress for the evening. I really wanted to pick out something that blends in beautifully with the “shades of chocolate” dress code, and yet, stands out as outré and extravagant amongst the rest at the chocolate carpet. What I finally decided upon, was a dress by Fahad Hussayn that epitomized Fahad’s sartorial brilliance in a knee length, digital printed frock. It had an embellished neckline that grawled with sensuality and yet retained an aura of austere elegance. I ended up pairing the attire with my Charles & Keith 4-inch heels, and headed over to the venue. Upon reaching, I was greeted by a glitzy chocolate carpet overlooking the Arabian sea. While some celebrities and fashioniistas ambled on and busied themselves with small talk, others couldn’t contain their fascination of the mirrored selfie booth. A Magnum-boat also awaited the arrival of the designers who supposed to make their grand entrance via the sea to the shore. Keeping up the tradition of starting the show fashionably late, the party soon moved indoors and I couldn’t help but wonder about the uncanny resemblance of the set up. A Chanel inspired runway-bar was set as a centre stage and the collections reflected Moschino’s food + fashion theme but nevertheless, our five fashion veteran designers along with couture-mavericks should be applauded for their efforts. 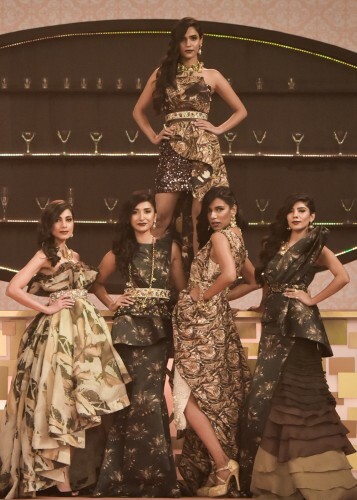 Shehla Chatoor opened the show with a highly magnumized collection. She took the inspiration of the Magnum wrappers to create body-skimming skirts and gowns in Belgian Chocolate hue and tinge of gold. Ms. Chatoor known for paying attention to detailing paired her collection with Outhouse Jewelry and quirky Magnum-shaped clutch which made it to my lust list. Khadija Shah of Elan stayed true to her voluminous, tapered silhouettes and intricate detailing. She opted for a glamorized look by emphasizing on the swoop-back pleated twills and embellished shirtwaists. While on one hand, Nomi Ansari played with different fabric textures and added a youthful edge to his Magnum creation through his statement fishscale skirt and brown hued pencil skirt which emulated dripping chocolate; on the other hand, Omar Farooq for Republic presented five different ways brown can be adapted in menswear. 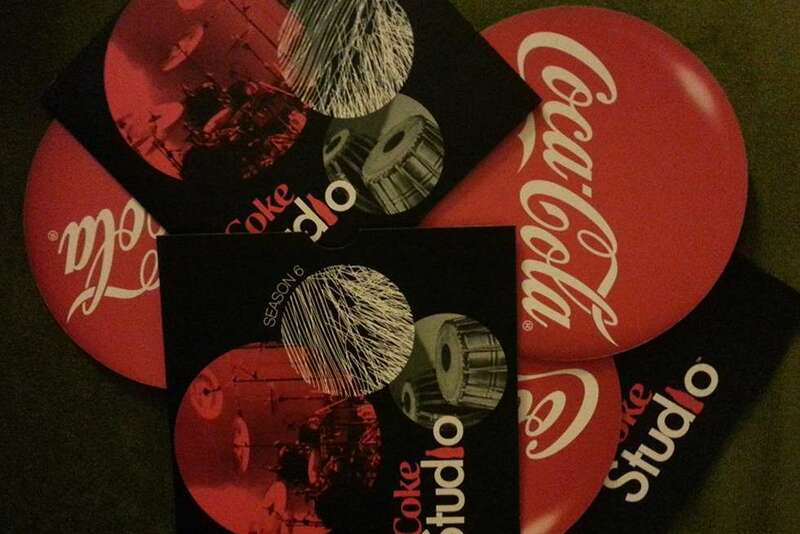 The star of the night was none other than, Maheen Karim with her aesthetically pleasing and coherent collection. She remained true to her signature style and showcased a majestic collection comprising of ruched asymmetric dresses in a bright combination of brown and gold and trendy pantaloons in punchy oranges. 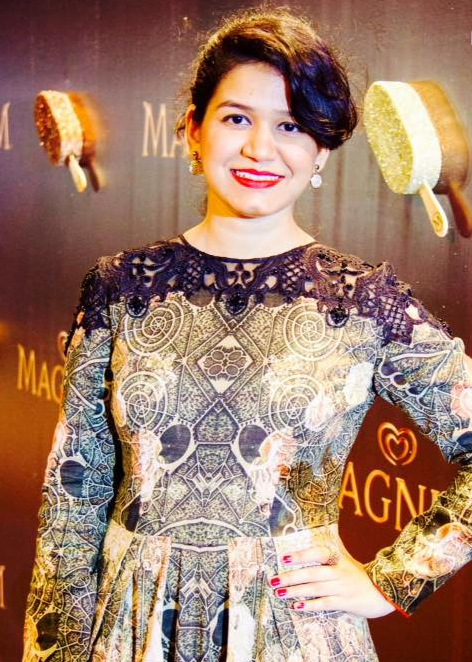 In all, according to me, Magnum Party 2015 deserves full credit for jolting Karachi from its stupor this weekend and ushering the start of a new fashion-season. While the luscious tones of cracking Belgain Chocolate dominated the runway, all things chocolate at all four corners of the hall in form of chocolate walls, dessert bars, Magnum bars and drinks was up for everyone’s pleasurable indulgence. Here, I’d also give an honoree shout out to, Ali Xeeshan and Fahad Hussayn who lent in their sartorial creed to create couture installations made out of icecream sticks and Magnum wrappers. Way to go, guys!